In this commentary on a traditional Guru Rinpoche visualization, the contemporary Dzogchen master Tulku Thondup Rinpoche reveals the deep nontheistic essence of Vajrayana practice. We receive the true blessings of the enlightened ones when our mind and theirs become one. The purpose of training in devotional meditations and prayers to great masters such as Guru Rinpoche is not to please them or induce favors for your personal gain. It is solely for training and transforming your mind into positive thoughts and blessed expressions so that your life will advance naturally and you will be able to serve many with positive and joyful force. Whatever you see and think, that is what you will become. In this meditation you visualize Guru Rinpoche in his pure land as the embodiment of all the enlightened ones and pray to him with total devotion. Then you receive the four levels of empowerments from Guru Rinpoche as his blessings. You unite your mind with his enlightened wisdom and rest there, in the state of intrinsic awareness in which there is no duality, concept, or sensation. The following description explains the stages of the meditation in greater detail. In front of you, visualize Guru Rinpoche in his Zangdok Palri pure land. See all the details clearly and brilliantly as real and remember their symbolic meanings as much as possible. Then see, think, feel, and trust strongly from the bottom of your heart that this is the actual presence of Guru Rinpoche and his pure land. Guru Rinpoche is the embodiment of all the buddhas, bodhisattvas, and enlightened masters. His love is unconditional, whether you are a good person or bad. He has boundless power to fulfill your needs, if you are mentally and karmically open. It is important to realize that Guru Rinpoche is not another person, but rather the enlightened qualities of your own mind’s nature reflecting in front of you as Guru Rinpoche. It’s like seeing your face looking back at you in a mirror. Zangdok Palri is the light of the wisdom of Guru Rinpoche appearing in the form of a Pure Land. Guru Rinpoche and Zangdok Palri are indivisible in nature and in quality, like the sun and its radiant aura. Meditation on and prayers to Guru Rinpoche are meditation on and prayers to Zangdok Palri, and vice versa. The form of Guru Rinpoche and his pure land is not earthly. It is an image of wisdom light — pure, radiant, boundless, intangible, and beyond subjective and objective distinctions. Every particle is a presence of the five buddha wisdoms and the five buddha families in the form of five wisdom lights, which are the purities of the five skandhas, five emotions, and five gross elements. In order to realize such an absolute Guru Rinpoche, you must open your heart, step by step, through meditations and prayers, with the force of devotion. With the energy of true devotion, pray to Guru Rinpoche, seeing him as the embodiment of all the enlightened ones. Sing the prayer mantra vocally or in your mind’s voice, repeating it hundreds and thousands of times. Sing the prayer in the sweetest melodies, like waves of joy that make your heart blossom further into a boundless force of devotion. Please grant me/us—all the attainments. In the sweetest sounds of a lute. After the devotional prayers, meditate on receiving the four empowerments. First, visualize a whiteOm letter at Guru Rinpoche’s forehead— the vajra-body center. 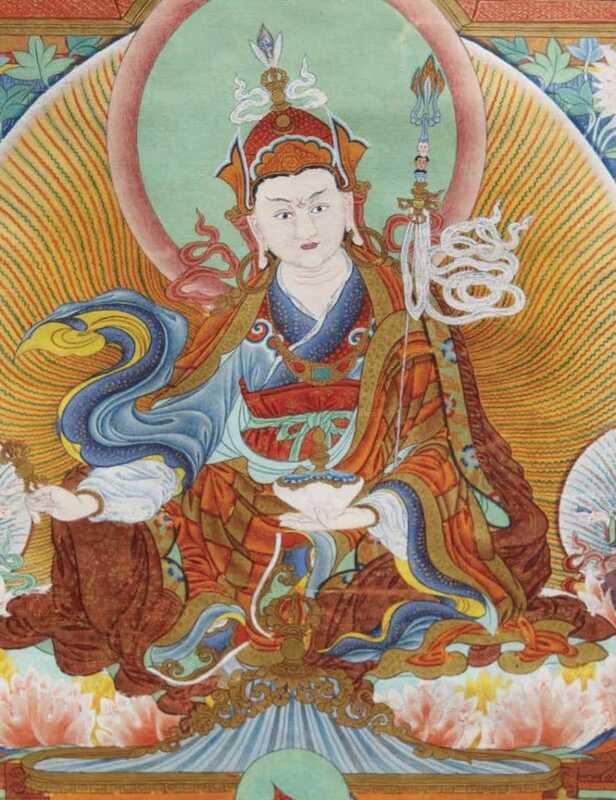 From theOm come Guru Rinpoche’s vajra-body blessings in the form of white beams of rainbow light. They enter the crown of your head and fill your whole body. Believe that all of your physical impurities have been purified. You have received his vajra-body blessings. 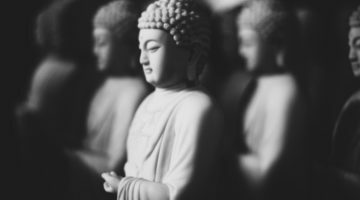 They have empowered you to realize the manifested-body of buddhahood. 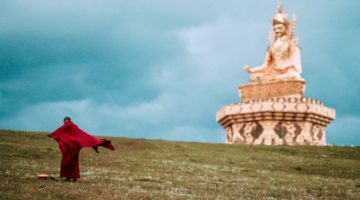 Second, from the red Ah letter at Guru Rinpoche’s throat—the vajra-speech center— come Guru Rinpoche’s vajra-speech blessings in the form of red beams of light. They enter your throat and fill your body. Believe that they have purified your speech and energy impurities. You have received his vajra-speech blessings. They have empowered you to realize the enjoyment-body. Third, from the Hung letter at Guru Rinpoche’s heart—the vajra-mind center—come Guru Rinpoche’s vajra-mind blessings in the form of blue beams of light. They enter your heart and fill your body. Believe that they have purified your mind and emotional impurities. You have received his vajra-mind blessings. They have empowered you to attain the ultimate-body. Lights of nectar are emanated gradually and then simultaneously. By merging them into one’s four places, four obscurations are purified. Four empowerments are received and four Buddha-bodies are realized. 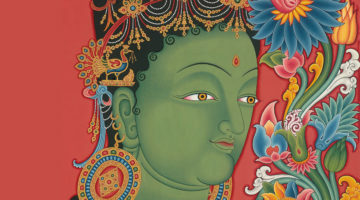 When your mind is fully open to and enjoying the blessings of Guru Rinpoche and Zangdok Palri with devotion, you will feel that your mind and body have become inseparable from them and start finding Guru Rinpoche’s presence and qualities in yourself, as it is natural to become whatever you see and enjoy, whether it is positive or negative. Om ah hung bedzar guru pema siddhi hung. Vajra Guru Padma(sambhava)! With all your attainments I am imbued. In the world of my own body. When your thoughts and feelings become the experiences and expressions of Guru Rinpoche’s blessings and presence, then whatever you see will arise as the images of Guru Rinpoche and his pure land—the union of appearances and emptiness. Whatever you hear will resonate as sacred prayers and sounds—the union of sounds and emptiness. Whatever you feel becomes the experience and expression of omniscient wisdom, unconditional love, and boundless power—the union of awareness and emptiness. As your attainments—all have been awakened. By, in the middle, realizing the clear light, the natural state. May I be received by hosts of the knowledge-holder lamas. May I be backed up from behind by the peaceful and wrathful deities. May I be surrounded by dakas and dakinis of the three spheres. May I take miraculous birth at the feet of Guru Rinpoche. Adapted with permission from Zangdok Palri: The Lotus Light Palace of Guru Rinpoche, published by Gatshel publishing, 2012. Distributed in North America by paragon Book Gallery, 2013. Is the Guru Model Broken?